A new sense of urgency and maybe a little envy have accompanied this year’s March for Life, with event organizers realizing they have a tough act to follow. Opponents of abortion watching the women’s march on their televisions last Saturday stewed as they saw the Planned Parenthood logo over the stage and actress Scarlett Johansson praising the group for the gynecological care she received as a teenager. But for these viewers, there was an even bigger problem. The women’s march had drawn an estimated half-million people to Washington, and many more to simultaneous demonstrations around the country, dominating the nation’s news coverage just six days before abortion foes were holding their annual march. Since then, the organizers of that march have been telling followers: You’d better turn out Friday. This year’s anti-abortion march in Washington — the 44th annual March for Life — was expected to be a celebratory event at which abortion opponents could finally savor a few victories. The new president, Donald Trump, is delivering on his promises to sign a slate of anti-abortion measures. He has promised to nominate a Supreme Court justice who could overturn Roe v. Wade, the decision that legalized abortion 44 years ago. And a Congress dominated by Republicans is poised to cut funding for Planned Parenthood, the nation’s largest abortion provider. But a new sense of urgency, anxiety, and maybe a little envy have accompanied this year’s event, with anti-abortion organizers suddenly realizing they had a tough act to follow. 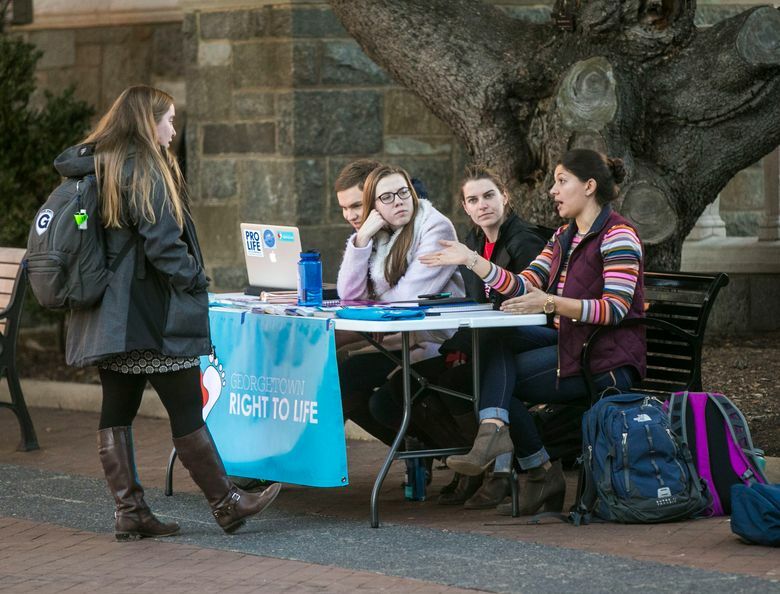 “We’re definitely pulling out all the stops this year to try to get people to come,” said Amelia Irvine, president of Georgetown Right to Life at Georgetown University in Washington. National organizers of the March for Life said that while they were hopeful of a large turnout Friday, they did not have any way to gauge how many would attend. The marquee speaker is Kellyanne Conway, who managed Trump’s campaign and is now a White House counselor, and has long been active in the anti-abortion cause. Organizers say there will be another “surprise VIP guest” whom they would not identify Wednesday, but that both Trump and Vice President Mike Pence have been invited. She said that calls and emails began pouring into March for Life’s offices Sunday from women who are opposed to abortion and were disturbed to see the strong abortion-rights message coming from the stage of the women’s march in Washington. Though many marchers come to the city by car or train, one gauge of expected attendance — bus-parking permits — suggests the event will be smaller than last weekend’s women’s march. As of Wednesday, 92 permits had been issued for the March for Life, according to Events DC and the city’s Department of Transportation, which handle the permits. Some 1,800 permits were issued for the women’s march, and 450 for Trump’s inauguration, the transportation department said. The march has become an increasingly youthful event, attracting busloads of college, high-school and middle-school students from across the country, many from Roman Catholic and evangelical Christian schools. This year, the University of Notre Dame, the famed Catholic college in Indiana, is sending 700 students on 13 charter buses, one of the largest campus contingents, said Emily Burns, vice president of communications with Notre Dame Right to Life. There is widespread resentment in the anti-abortion movement that the media has not devoted much coverage to the March for Life in the past, perhaps because it happens every year. This year, a large coalition of anti-abortion groups has banded together to pressure television and cable networks to devote the same kind of media coverage to the March for Life as they devoted to the women’s march. Still, compared with abortion-rights supporters, organizers of Friday’s march may have a smaller base of people to draw from. A survey released by the Pew Research Center in October found that 59 percent of Americans said abortion should be legal in all or most cases, while 37 percent said it should be illegal in all or most cases. Although there were wide gaps between Democrats and Republicans, overall support for legal abortion was at its highest level since 1995, the survey found.